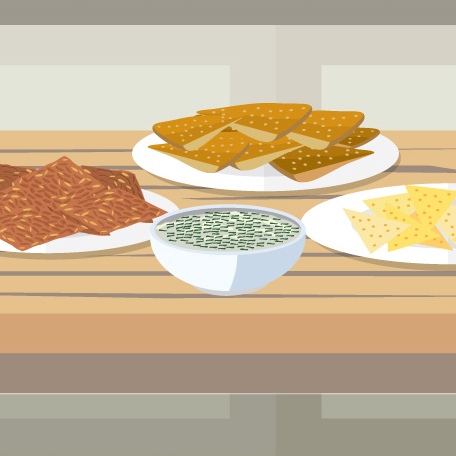 With cold weather and football season underway, the demand for warm, cheesy dishes and snacks is high. Dips are the perfect snack to serve a crowd, especially when everyone craves something hearty and comforting but a full meal is out of the question. Unfortunately, those decadent snacks are often packed with fat, calories, and sodium. Luckily, a few alterations can transform any dip recipe by reducing calories, fat, and other bad stuff. While it may make any cook more comfortable to turn to a recipe when making a dip for a crowd, creating unique flavor combinations is easier than it may seem. There are three main components to consider: temperature (is it served hot or cold); texture (is it creamy, chunky, or smooth); and flavor. If creativity isn’t your strong suit, try a twist on a classic dip. If you love spinach artichoke dip, spice it up with some curry powder for an Indian-inspired kick. Instead of opting for a typical pizza dip, try adding different pizza toppings to the mix (such as pesto, spinach, and chicken) or make a white pizza dip without tomato sauce. Don’t be afraid to play around with flavors and create something new. There’s always a way to improve on a classic. The 13 dips listed below are tried-and-true party favorites, but with some easy swaps and prep changes, you can make each one a tad healthier. Enjoy these crowd-pleasing snacks without guilt. Salsa is pretty healthy as-is, but homemade versions are typically more nutritious and delicious than store-bought varieties. Make this classic dip more interesting by adding fruit (like in the mango salsa recipe linked above), beans, or additional veggies to the mix. How it’s healthier: Homemade salsa has no preservatives, and this recipe offers a healthy mix of different fruit and veggies. Pair with: Homemade tortilla chips, pita chips, tarot root chips, or endive leaves. Typically made with avocado, tomato, and a few seasonings, guacamole is usually pretty healthy. It is also pretty high in calories thanks to the avocadoes, which are packed with healthy fats. How it’s healthier: This recipe cuts calories and fat by replacing half the avocado with diced zucchini. Pair with: Homemade tortilla chips, homemade pita chips, jicama, bell pepper, or endive leaves. This spicy, protein-packed dip usually features full-fat cream cheese and a mix of other shredded cheeses. How it’s healthier: In this healthier version, a mixture of Greek yogurt and low-fat cream cheese lends the same tangy flavor and creamy texture without the high calorie count. Pair with: Sliced bell peppers, homemade pita chips, or homemade tortilla chips. Jalapeño poppers are a party favorite, and they’re just as good when turned into a delicious dip. Unfortunately, those dips can be heavy in full-fat cheeses and sour cream. How it’s healthier: This recipe calls for low-fat cream cheese and Greek yogurt in place of sour cream and full-fat cream cheese. Pair with: Sliced bell peppers, broccoli, green onions, homemade pita chips, or homemade tortilla chips. Think of this dip as all the goodness that goes on top of pizza made into a dip. Plus, you can customize the ingredients. How it’s healthier: The recipe calls for fat-free cream cheese, low-fat Greek yogurt, and low-fat cottage cheese, giving it a creamy base. For toppings, chopped bell pepper, mushrooms, and mini turkey pepperonis (which are typically lower in calories and fat than the traditional kind) work well. Pair with: Homemade pita chips, thin toasted rounds of whole-grain bread, bell peppers, or cauliflower. This classic American party dish is filled with all things Tex-Mex. Traditionally made with refried beans, sour cream, guacamole, pico de gallo, lettuce, black olives, and cheese, it’s easy to make the recipe a bit healthier without sacrificing flavor. How it’s healthier: To improve on this classic, a mix of black beans cooked with spices replaces refried beans. Plus, it calls for only a small amount of sour cream, and it is topped with a variety of freshly chopped veggies, including lettuce, tomato, cucumber, and red onion. Pair with: Bell peppers, cucumber slices, endive, jicama, or homemade pita or tortilla chips. The easiest way to make this classic football party favorite is to combine a can of tomatoes and green chilis with a log of processed cheese – but it’s not exactly the most health-conscious party snack. How it’s healthier: Instead of relying on cheese for all the flavor, this queso dip recipe incorporates a number of spices and aromatics (including garlic and fresh jalapeños). In addition, it calls for coconut milk and Greek yogurt to get that creamy texture. Pair with: Homemade tortilla or pita chips, or any number of veggies, such as broccoli, asparagus, bell peppers, green onions, and asparagus. Store-bought hummus is convenient and not necessarily unhealthy, but it has added preservatives and sodium. How it’s healthier: By using edamame in place of chickpeas, this recipe gives you the classic hummus texture and a similar flavor with fewer calories, less fat, and more protein. Pair with: Any vegetable (cucumber, carrot, and bell pepper are a few favorites), homemade pita or tortilla chips, butternut squash chips, or tarot chips. Leave the can of onion dip or packet of mix in the chip aisle. Making this dip at home is pretty simple, and it gives you a tastier, healthier product. How it’s healthier: This recipe replaces mayo and sour cream with plain Greek yogurt, and it uses caramelized onions with a few extra seasonings instead of dried onion bits and other artificial ingredients in store-bought versions. Pair with: Homemade butternut squash or tarot chips, homemade pita chips, or a variety of vegetables, such as broccoli, bell peppers, celery, carrots, or asparagus. Any dip that has two vegetables as a main ingredient should be healthy, right? Wrong! Thanks to heavy doses of mayonnaise and cheese, classic versions of this favorite dip can be very high in calories and fat. How it’s healthier: Instead of sour cream or mayo, this recipe relies on puréed white beans and a bit of vegetable stock to achieve a creamy texture. These swaps cut fat and calories while upping protein content. Pair with: Homemade pita or tortilla chips, endive leaves. When it comes to dip, it doesn’t get more basic than classic ranch. How it’s healthier: Greek yogurt makes this healthier version creamy, while garlic, chives, parsley, and lemon juice give it tons of flavor. Pair with: Pretty much any vegetable – from classic carrots and celery to asparagus or endive leaves – or homemade pita chips. A Southern favorite, pimento cheese is typically made with mayonnaise and a whole bunch of cheddar cheese. How it’s healthier: This healthier version relies on Greek yogurt and fat-free cream cheese in place of mayo and some of the full-fat shredded cheese. Pair with: Homemade tortilla or pita chips, or any heartier veggies – bell peppers, endive, or cauliflower work well. Green Goddess dip or dressing is already pretty healthy, but it can be improved by removing the mayonnaise and sour cream. How it’s healthier: Instead of mayo and sour cream, this recipe uses Greek yogurt and avocado to get that creamy finish. Pair with: Any vegetable or homemade pita chips.